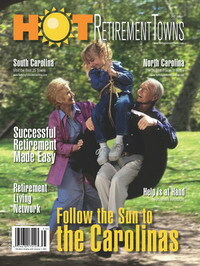 READ ARTICLES ON RETIREMENT TOWNS IN FLORIDA. RETIRE TO FLORIDA. discover new and interesting information. 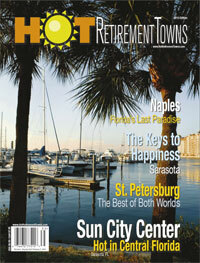 Maybe Retiring to Florida is for you! According to locals and visitors, the sand on Destin�s beaches, the byproduct of a curious juxtaposition of aquatics and geography, is the whitest in the world. The finely ground quartz crystals, which look more like the sugar in your morning coffee than the sand that squishes between your toes, originate in the Appalachian Mountains. The residue flows down the Apalachicola River to the Gulf of Mexico, where currents create sand drifts along the Gulf Coast, from east of Panama City, Florida, to the shoreline of Alabama. PENSACOLA, NOT St. Augustine or Jamestown, was the first European settlement in the continental United States. In 1559, Don Tristan de Luna landed with 11 ships laden with gear, food and 1,500 passengers. Just three months later, a hurricane swept through, killing hundreds and destroying the camp and several ships. As famine spread, the settlement was abandoned, and it would be more than a century before the next group of settlers arrived. Today, Pensacola is a thriving Gulf Coast city of approximately 54,000 residents. Naval Air Station Pensacola, located on the same ground as Don Tristan de Luna�s original settlement, is home to the renowned Blue Angels. The city of Rockledge, located on central Florida�s fast-growing Space Coast, is surrounded by a wide variety of recreational, educational and just plain fun activities. FUN FACT: Florida's State Motto is "In God We Trust" which was adopted from the Silver Dollar on August 6, 1868 and officially signed into law on June 22, 2006.